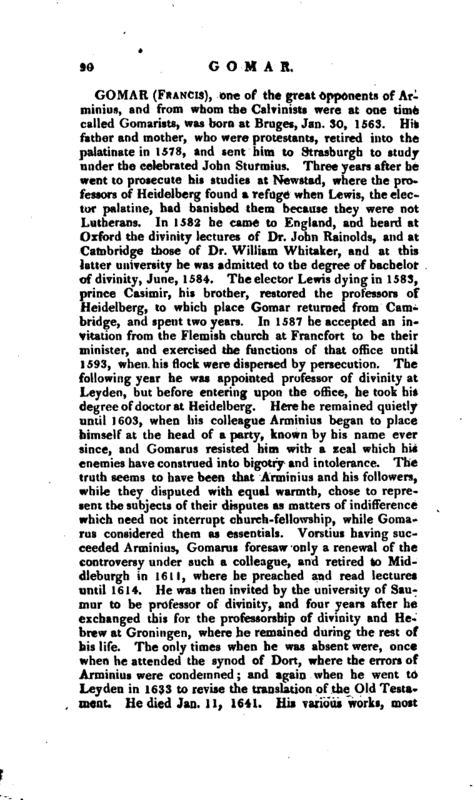 , a German antiquary, was born at Venloo, in the duchy of Gueldres, in 1526. 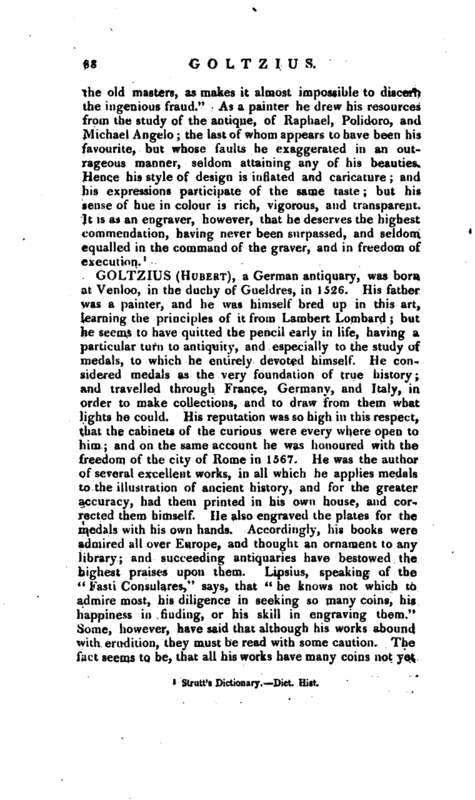 His father was a painter, and he was himself bred up in this art, learning the principles of it from Lambert Lombard; but he seems to have quitted the pencil early in life, having a particular turn to antiquity, and especially to the study of medals, to which he entirely devoted himself. He considered medals as the very foundation of true history; and travelled through France, Germany, and Italy, in order to make collections, and to“draw from them what lights he could. His reputation was so high in this respect, that the cabinets of the curious were every where open to him; and on the same account he was honoured with the freedom of the city of Rome in Io67. He was the author of several excellent works, in all which he applies medals to the illustration of ancient history, and for the greater accuracy, had them printed in his own house, and corrected them himself. He also engraved the plates for the medals with his own hands. Accordingly, his books were admired all over Europe, and thought an ornament to any library; and succeeding antiquaries have bestowed the highest praises upon them. 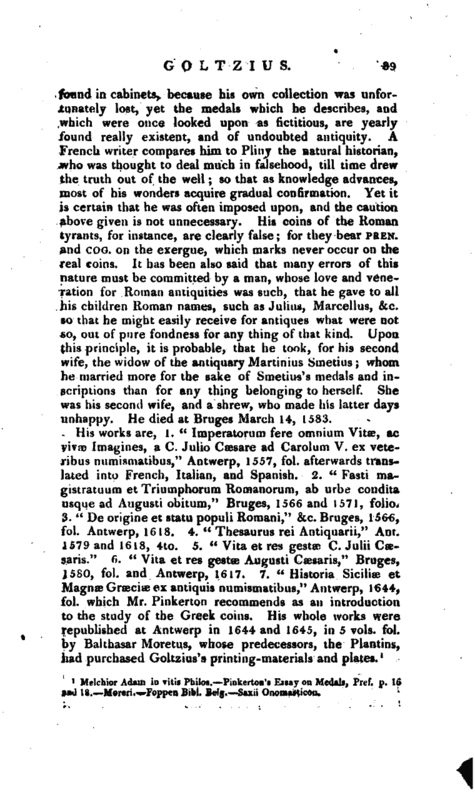 Lipsius, speaking of the” Fasti Consulares,“says, that” he knows not which to admire most, his diligence in seeking so many coins, his happiness in finding, or his skill in engraving them." Some, however, have said that although his works abound with erudition, they must be read with some caution. The fact seems to be, that all his works have many coins not yet | found in cabinets, because his own collection was unfortunately lost, yet the medals which he describes, and which were once looked upon as fictitious, are yearly found really existent, and of undoubted antiquity. A French writer compares him to Pliny the natural historian, who was thought to deal much in falsehood, till time drew the truth out of the well; so that as knowledge advances, most of his wonders acquire gradual confirmation. Yet it is certain that he was often imposed upon, and the caution above given is not unnecessary. His coins of the Roman tyrants, for instance, are clearly false; for they bear Pren. and Cog. on the exergue, which marks never occur on the real coins. It has been also said that many errors of this nature must be committed by a man, whose love and veneration for Roman antiquities was such, that he gave to all his children Roman names, such as Julius, Marcellus, &c. so that he might easily receive for antiques what were not so, out of pure fondness for any thing of that kind. Upon this principle, it is probable, that he took, for his second wife, the widow of the antiquary Martini us Smetius; whom he married more for the sake of Smetius 1 s medals and inscriptions than for any thing belonging to herself. She was his second wife, and a shrew, who made his latter days unhappy. He died at Bruges March 14, 1583. 1 Melchior Adam in vitis Philos. Pinkerton’s Essay on Medals, Pref. jp. 16 nd 18. —Moreri.—Foppen Bibl, Belg, Saxii Onoinastison.